Emily M. Dickens, J.D., serves as the Society for Human Resource Management’s (SHRM) Corporate Secretary and Chief of Staff. 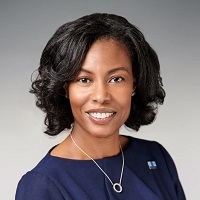 She is the executive responsible for coordinating staff to implement the CEO’s vision, serving as corporate secretary for the SHRM Board and subsidiary boards, as well as managing external partnerships and providing oversight for the Government Affairs division. Dickens is an attorney with significant and progressive experience in government, higher education and the non-profit sector. She has served as a member of the leadership team at the University of North Carolina system, the Association of Governing Boards of Colleges and Universities and the Thurgood Marshall College Fund. Her prior roles include general counsel, chief relationship officer, senior vice president, vice president for public policy and assistant vice president for federal relations. Dickens has also worked at Duke University and Fayetteville State University in administrative and external affairs roles. Emily is actively engaged in board service. She formerly served on the Fayetteville/Cumberland (NC) Chamber of Commerce (Secretary of the Board), the Cumberland County Workforce Development Board, the North Carolina Partnership for Defense Innovation Board, and the Educational Advancement Foundation. She is currently a member of the Advisory Council of the Congressional Hispanic Caucus Institute (CHCI), the Advisory Board of the College of Arts and Sciences at North Carolina Central University and chairs the International HBCU Task Force for Alpha Kappa Alpha Sorority, Incorporated. She is a graduate of North Carolina Central University and North Carolina Central University School of Law.